Cloudriven has achieved a high Rating Alfa classification, which only about ten per cent of Finnish companies reach. The classification shows that Cloudriven has excellent financial key ratios, positive background data and payment behaviour. The classification is given by Suomen Asiakastieto. 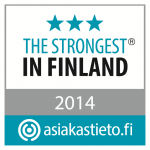 As an indication of outstanding financial performance, Asiakastieto has given Cloudriven permission to use Strongest in Finland badge. 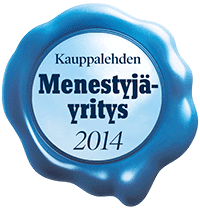 The biggest financial newspaper in Finland, Kauppalehti has given Cloudriven a certificate for successful business performance. This recognition is given to a company that understands customers’ needs and has a competent management team, dedicated employees and efficient processes. Only five percent of all the companies in Finland receive the certificate. Based on financial figures, Cloudriven is one of the top performers both in Finland and in the IT industry and the company’s business is built on solid ground. “Our business is on a healthy growth track and this certificate is an amazing indication that we’ve chosen the right path. 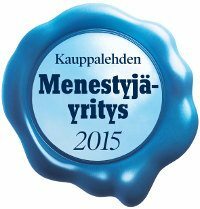 Our investments in customer satisfaction and new services have borne fruit”, says Cloudriven’s CEO Jukka Koskenkanto.